Our love story is long but how do you briefly sum up love?! 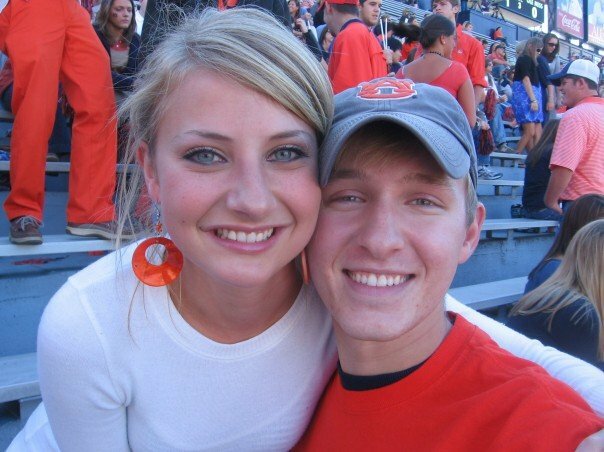 Almost 5 years ago, Corey and I both were competing against about 95 other people for 40 slots in the Architecture program at Auburn. It’s a full summer of intensive designing, drafting, rendering, modeling, etc. It’s incredibly cutthroat and exhausting, with many hours of sleep lost, many many tears, and the loss of any sort of balanced diet in one’s life. The professors rank you against your peets and make cuts halfway through the summer and again at the end of the summer. It seriously deserves its own reality show. BUT – anyone who has ever been through it knows that the friendships you forge along the way and along the next 4-5 years of school are the kind that last a lifetime. There’s something about going to h*ll and back that brings people together. 4 people in our wedding party went through architecture school with us! Some pics of them below. So ANYHOW, all this to say I met Corey during Summer Option after the end of the first cuts. We became fast friends – I don’t know if it was the unusual circumstances that brought us together or if it was our common interests, but God planned it perfectly. We lived in the same apartment complex so we often found ourselves spending time together carpooling, eating meals, watching Entourage, or spending late nights at studio. I honestly never thought anything of it – he was just another friend of mine. My friend Michelle (pictured in 2nd pic above) that summer told me that I needed to date him and I thought that was just such an insane notion. ‘I don’t think of him THAT way, Michelle.’ I shrugged it off. We got one week off after the end of Summer Option and then returned in August to start the school year. I was so excited when he got back that I insisted on seeing him the night he returned even though he didn’t get back until really late. I took over some really bad alcoholic smoothies and we played cards. Fast forward a few months, we were over at Michelle’s house and another girl Allison was there. Allison said something along the lines of – ‘it is so obvious y’all are into each other.’ I almost fell out of my chair laughing. I was like, ‘NO WAY! We don’t think of each other that way.’ Fast forward another 2 months – I had a friend stand me up for a football game (who is now a bridesmaid and all is forgiven!) and I called him crying and overly upset. He swooped in and saved the day even though he had about 12 friends staying with him. He came and got me and I thought ‘Gee, that was so nice of him.’ I admitted to him sometime in those few weeks I had kissed a guy I met at a party with obvious guilt and he was OBVIOUSLY jealous. Later on, I went home to visit my family and I told my sister I thought I wasn’t just into him, but hopelessly in love with him. My prior few weeks with him had transformed how I felt about him. She told me to just tell him I was in love with him. So that’s what I did. This is a couple of weeks before we started dating (still in the friend box). He’s so cute. My birthday came around a few weeks after, on Nov 11 to be exact, and he had promised me he’d take me out to Cracker Barrel since I love that place and there wasn’t one in Auburn. We ditched studio and headed that way, and afterward, I went to my apartment to get some brews and let my roommate/bridesmaid Kristy know I was going to tell him I liked him. We were watching V for Vendetta at his place and one of us was scratching the other’s back. I honestly can’t remember who, but either he or I kissed the other on the cheek and I looked at him and sighed “Who are we kidding?” and he said “What? !” And I said, “Corey, I am so in love with you.” He was awkward and fumbling and truly at a loss for words. We did kiss, but I had totally blindsided him. After he recovered from that, it was clear he felt the same, so we became boyfriend and girlfriend that night (Nov 11, 2007) and we haven’t looked back since. This was one of the happiest days of my life - in a 'suburb' of Rome, Italy enjoying good food, good wine, good company, and beautiful surroundings. Our good friend Clay Wilks took this photo of us. So we have spent the past 5 years together in school, traveling abroad (Rome, Tuscany, Venice, Barcelona, Switzerland), looking for jobs, getting dual degrees, going to concerts, eating awesome food, making new friends, and being broke as a joke together. We are now broke and in love and working as intern architects in Atlanta. Happily Engaged!! The End. Next UP – the PROPOSAL STORY!